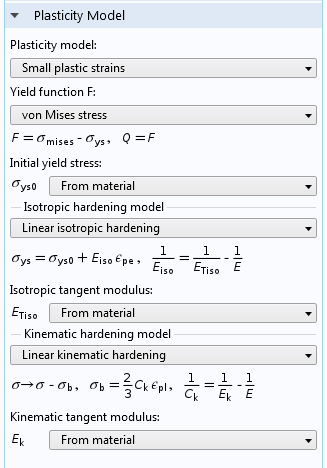 For users of the Nonlinear Structural Materials Module, COMSOL Multiphysics® version 5.2a brings an extended Hyperelastic Material model with the ability to model large-strain viscoelasticity, as well as new material models for kinematic and isotropic hardening and the ability to mix these models for modeling elastoplastic materials. 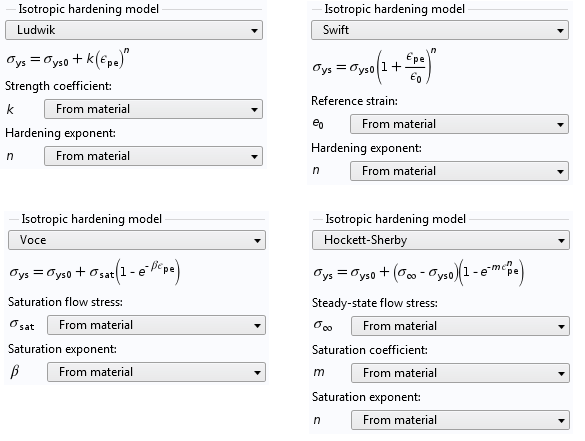 Review all of the Nonlinear Structural Materials Module updates in further detail below. Generalized Maxwell, Standard linear solid, and Kelvin-Voigt models. Williams-Landel-Ferry (WLF), Arrhenius, and User defined temperature shift functions. 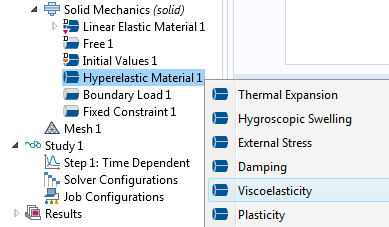 By right-clicking the Hyperelastic Material model node, you can add a Viscoelasticity subnode.